China’s island building is aimed at securing a weak link in its maritime trade networks. As the U.S. navy and rival Asian claimants respond to China’s building of military-grade infrastructure on disputed islands, heightened risks of conflict raise alarm bells over destabilization in a vital arena of global trade. The world awaits the deliberation of the Hague on the matter, but its decision will have little impact on China’s actions, which are anchored by Beijing’s grand ambitions to secure an unrivaled commercial empire throughout Eurasia and Africa. The tropical warm waters of the South China Sea betray an idyllic calm, but the region has become the center of a great international flashpoint. Developing what were once half submerged reefs into sizable islands, China has frenetically reclaimed and built 3200 acres of new territory on the islands within its control. In addition, it has built sizable military and civilian infrastructure that have decisively tipped the fragile balance of power in the hotly contested region. China’s ambitions have provoked the ire of rival claimants like the Philippines and Vietnam, while stoking tensions with the United States. However, despite loud condemnation, China has refused to bend to pressure, and instead has pushed forward with its ambitious plans of power projection, causing many to fear the terrible fallout that may occur due in an atmosphere fraught with heightened tensions. A cursory analysis of China’s growing trade and investment patterns points to two primary motivations underpinning its South China Sea strategy: China’s commercial ambitions and its relative naval weakness. China’s growing commercial empire, bolstered by trade with Europe, Africa, the Middle East, and South Asia, possesses one glaring weak link — that much of its maritime borders are vulnerable to the control of foreign powers. This reality guarantees that tensions in the region will undoubtedly continue to rise, though the chances of full blown conflict remain slim. After two decades of rapid industrialization and economic growth, China has emerged as the world’s largest trading nation, registering a combined volume of over $4.3 trillion dollars in 2015. Chinese outward foreign investment has soared from a trickle ten years ago to nearly $120 billion in 2015. China has become the largest trading partner in Africa, with trade passing $160 billion in 2015. China ranks as the second largest trading partner to Europe, with trade standing near $580 billion annually. Meanwhile, China has also made significant headway in trade and investment into the Middle East and South Asia. In order to consolidate and link its massive and continually expanding commercial empire, China has promoted the strategy of “One Belt, One Road,” a resurrection of the ancient Silk Road. If it succeeds, this project will fundamentally shift the global balance of power in China’s favor, substantially building an infrastructure of trade throughout Eurasia and Africa with all roads ultimately leading to China. With current projected spending surpassing $1.3 trillion, the new Silk Road will link over 60 nations throughout Eurasia and Africa with a combined population of 4.4 billion through a colossal number of infrastructure projects from rail and pipelines to ports and maritime infrastructure. China’s brimming ambition seeks to facilitate the development of cohesive infrastructure linking three continents and uniting them into a trade empire unrivaled in history. China’s One Belt, One Road project is composed of two primary routes. One is a land route that winds through the great Eurasian hinterland linking China with its ancient trading partners in Central Asia and the Middle East and then on to Europe. The other route is the maritime route, which runs through the South China Sea and the Malacca Straits, and onward through the Indian Ocean to Africa and to the Middle East and Europe. China’s rapidly growing commercial empire presents it with immense security challenges. While China has traditionally been a continental power, it has not fielded a great navy since the 15th century when Zheng He’s gargantuan fleet sailed to Africa. In the modern era, China went from defeat at the hands of Western gunboats to imperial collapse and then the chaos of the Maoist era. Since China is a latecomer to the modern arena of great power politics, it has found its maritime borders to be dominated by foreign powers, from the United States to regional Asian states. This fact leaves China’s colossal investments and trade vulnerable to the whims of foreign navies, a situation which is the cause of anxiety in Beijing. This insecurity has driven China’s substantial focus in modernizing and upgrading its navy, which now boasts of one aircraft carrier, with another currently being built and two more planned in the next decade. In the South China Sea, China’s claims have existed since at least the Republican era. However, beset by domestic problems, China has been slow to enforce its claims. China’s recent actions reflect a significant increase in investment on the contested islands within its control. These are all part and parcel of China’s attempts to establish a beachhead of control in order to monitor and protect the trade routes that it increasingly depends on. To put it simply, China’s obsession with building up fortifications in the South China Sea is driven by its fear of losing control over its vital trade routes and thus having its national interests effectively denied by use of naval force. As China moves forward with its ambitious Silk Road project, its sense of urgency has kept pace to make sure it will have the naval infrastructure to protect its commercial interests from the South China Sea to Djibouti, where China has established its first overseas military base. Inarguably, China’s continued development of its naval capabilities in the South China Sea, through which $5.3 trillion of global trade passes each year, has raised the ire of rival claimants to the Spratly and Paracel Islands. China has managed to push both the Philippines and Vietnam into the arms of the United States. The Philippines have signed new pacts with the U.S. navy, upgrading its presence in its military bases, while Obama’s recent visit to Vietnam signaled a new era of cooperation with the lifting of the arms embargo. In addition, American jets continually cross into spheres around China’s artificial islands, which heighten the possibilities of potential conflict. At the same time, a “hot war” with the U.S. navy would be potentially disastrous for China’s economy. Therefore, the likelihood of China taking over the islands controlled by rival claimants and exacerbating tensions are low. China does not need to take more islands in order to establish effective dominance of the waters. China’s control of this key gateway can be secured by the expansion of its current islands and their increasing fortifications. Therefore, Beijing will likely continue to walk a fine balance where it can incrementally gain the strategic upper hand without letting tensions spill over into a direct military confrontation. Clearly, these events ultimately hurt China’s attempts at promoting an image of its “peaceful rise” and itself as a partner for development in Southeast Asia. 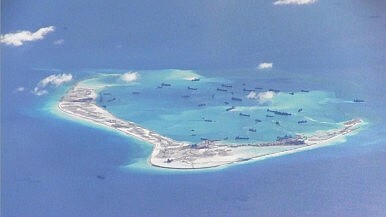 However, despite frayed relationships with the Philippines and Vietnam, and a potentially disastrous military clash with the U.S. navy, there is little doubt that these risks are a price that China is willing to pay in order to establish effective control over vital maritime links to its vast commercial empire beyond the Indian Ocean. Therefore, the region is likely to head towards more tensions before a status quo will be reached. Frederick Kuo is a San Francisco-based published writer. His writing focuses on current events and economic analyses within a social and historical framework. His articles have been published on Quartz, The National Interest, Citymetric, SF Examiner and much more. You can follow his writing on his website amberpen.com.